Southampton midfielder James Ward-Prowse says captaining England Under-21s can help him realise his long-term ambition of leading his club. 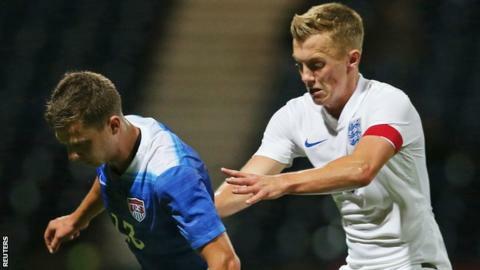 Ward-Prowse scored as England beat Switzerland 3-1 in Monday's European Championship qualifier in Brighton. The 21-year-old has captained Gareth Southgate's side five times and hopes to take the confidence into club level. "To get this experience now, it's going to stand me in good stead for the future," he told BBC Sport. "Gareth Southgate has helped me a lot in adapting to the role of being captain, but trying to nail down a permanent spot in the Southampton side is the priority at the moment." Ward-Prowse's penalty made it 1-1 with eight minutes remaining, before late goals from Sunderland's Duncan Watmore and Hull's Chuba Akpom secured all three points to keep England top of Group Nine. "To play for your country is nice, but to lead them out is fantastic," added Ward-Prowse, who has made 11 Premier League appearances this season. "It's broadened my experience and given me a different role in the team and I'm enjoying every minute of it."